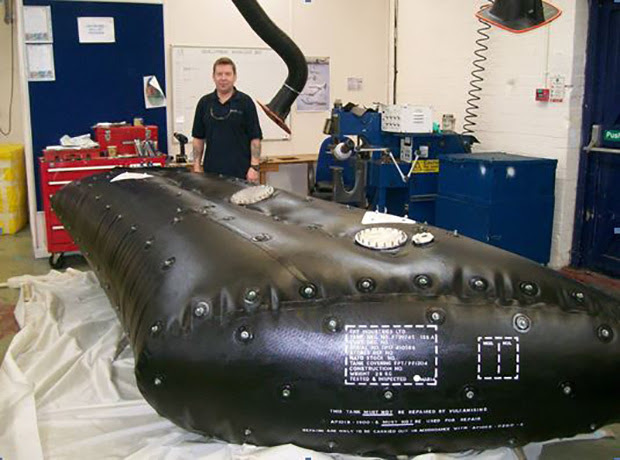 The completed tank under inflation testing. WarbirdsNews keeps close tabs on the status of Avro Vulcan XH558. We learned recently that they received a newly manufactured and tested fuel tank last week, courtesy of Fire Proof Tanks of Portsmouth. Part of GKN Aerospace Services, FPT donated their tank and services towards the Vulcan’s return to flight for this season. GKN Aerospace is well known for their extensive product range covering many types of fixed and rotary wing aircraft, land vehicles, missiles, UAVs, torpedos and marine vessels. 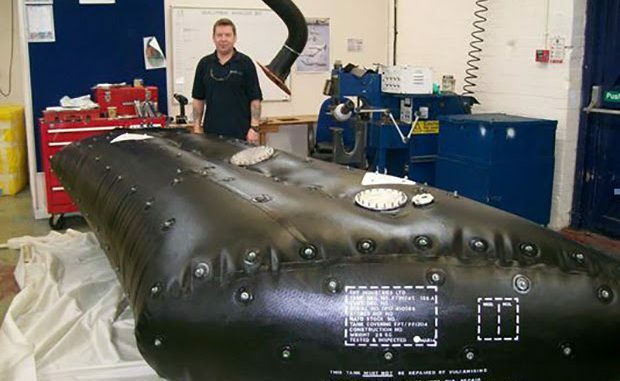 They have also designed, qualified and manufactured a variety of range-extender tanks and auxiliary fuel tanks for fixed wing and rotary wing aircraft. They meet all international standards, providing optimum safety for occupants using the latest technological developments. It is great that they are willing to commit their sponsorship in helping keep the Vulcan in the sky. As mentioned in XH558’s latest newsletter, the maintenance crew laid the tank flat in the correct position on the starboard wing a couple of days ago to permit measurement of the aircraft’s true empty weight. They will fit the tank next week, and WarbirdsNews expects a further update from Vulcan To The Sky on their last few winter servicing activities. They will tow XH558 outside for partial refueling once the the new tank is in place, before returning her to the hangar for another session on the hydraulic jacks. The procedures require the aircraft have at least a 40% fuel loading before conducting undercarriage retraction tests, a further demonstration of just how complex a job it is to keep XH558 airworthy.